Leviton offers many products that will help lower electrical costs and add convenience to everyday living. By simply replacing standard switches with dimmers reduces energy consumption and extends bulb life. Leviton's Sure Slide dimmers and fan speed controls feature elegant Decora brand styling that coordinates perfectly with the entire line of Decora brand designer products. Sure Slide dimmers offer easy, precise slide control of lighting levels. 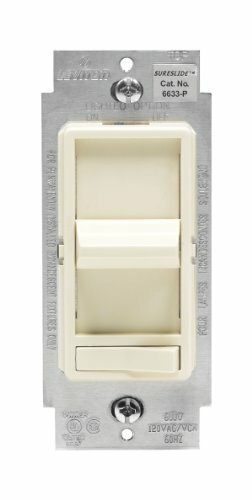 600W, 120-Volt Ac 60Hz, 3-Way, Sure Slide Preset Incandescent Slide Dimmer, Illuminated, Light Almond.